Many people wonder what they might be able do on their own to rescue their cat themselves. For those people I present some ideas below, and you may have some better ideas of your own. I have seen some thoughtful and creative home solutions, and this video demonstrates one of the most clever and carefully planned of them all. Please keep safety in mind -- not only the cat’s but yours as well. If there are any power lines nearby, don’t do anything at all except call a professional. Your life is on the line, so don’t take any chances. You also need to be sure there are no bee hives or other animals, such as raccoons, in the tree. Another consideration is the tree itself. There may be large, broken branches hanging overhead that could fall with little or no disturbance. The tree itself could be unhealthy and on the verge of collapse even though it may appear fine to you. This is certainly not an exhaustive list of all the safety issues; many things can go wrong. If in doubt, call me instead. With that caveat, here are some ideas you can try. If you have any other creative solutions that work to successfully bring your cat down, I hope you will share them with me. The first tool most people turn to is the ladder. Ladders are great tools, but they are also very dangerous. Personally, I would rather climb 100’ up a tree using ropes than climb a 10’ ladder. The higher the ladder, the easier it is to turn them over, and you don’t want to be wrestling with a wiggling, clawing cat in that precarious position. With that said, I have known some people who have successfully rescued their own cat that way, but do not try that with an unknown or feral cat. While I do not recommend a ladder for people, I do recommend them for the cat. If the cat is low enough to be reached by ladder, some cats will rescue themselves by stepping down the ladder on their own. This is uncommon, but it is certainly worth a try. It is important that the ladder be placed at a gentle enough angle so that the cat can keep his body positioned above the next lower rung. Most of a cat's weight is on his front legs, and he needs to be able to balance his body squarely over the lower rung while his back feet are on the upper rung. If the ladder is too steep, he will not be able to use it. The link below shows a short video of a cat who rescued himself by ladder. The ladder was placed in the tree for a person to climb to rescue the cat, but the cat could not wait and decided to come down on his own. It is well worth a view. One of the easiest, simplest ways to get a cat down is to give him a ramp so that he can walk down on his own in his preferred, head-first way. If the angle of the ramp is not so steep that he can still hang on and feel safe doing so, then he will almost certainly take advantage of the opportunity. For shy cats, you may need to leave the area so the cat will feel safe going down. To some rescues, I will carry with me two 12-foot 2x4 boards which I have covered with a short-nap carpet. This makes an excellent ramp if the situation is suitable. On the underside of each board are holes where I can screw in a long metal hook like the kind used for organizing items your garage. The idea is to place one end of the ramp on the lowest branch the cat can reach, using the hook to hold it in place, and then place the other end on a lower point, either another branch, a branch in a nearby tree, a building, a fence, a step-ladder, or anything that allows the cat to get to a lower point. From that point, you can reposition the board to get them to the next lower point. If the angle of the ramp is too steep, the cat will not try it. Obviously, the longer the ramp, the better your chances of finding a way to make it work, but very long boards are heavy and difficult to maneuver. You may be tempted to use 1x4 lumber instead, but at long lengths, it flexes and bounces too much, and the cat will not feel comfortable with it. You may also be tempted to not cover the board with carpet or some other gripping surface, but unless the angle of the ramp is especially gentle, the cat will not likely be able to get a secure grip on the bare wood. Do not limit yourself to just lumber. Long limbs that have fallen out of trees may be put to good use this way. A long ladder may work if the angle is not too steep, and I once used the cardboard tube from a roll of carpet (with carpet attached) to help a cat get from one spot in a tree to another where he could get down on his own. The elevator option is much more challenging, but if you feel up to it, then it may be worth a try. The elevator is simply a box with an opening that can be raised to the cat and lowered after he steps in it. Any box may do as long as it fits the cat reasonably well and is secure enough to hold his weight. You can use a cat carrier, a recycling bin, a kitchen trash can, a laundry basket or any other container you might have available. 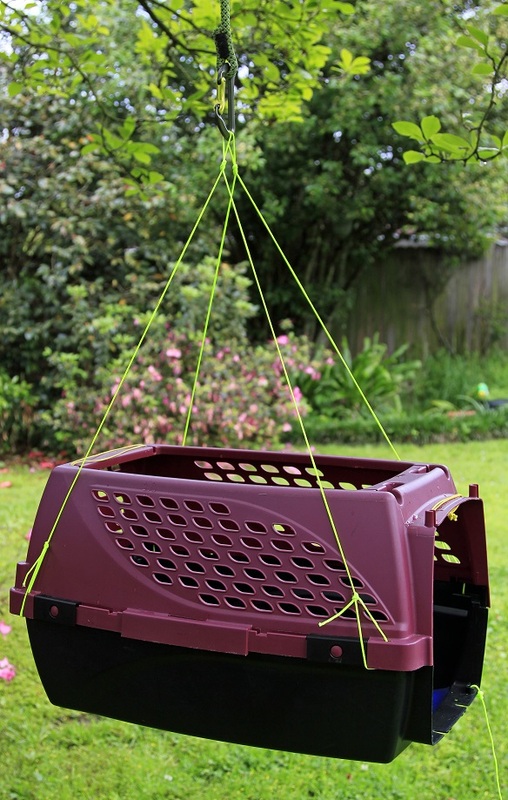 Containers that are wider than they are tall should be supported with ropes attached to each corner, so that it will not tilt far as the cat moves from one corner to the other. This is not a concern for tall containers such as a trash can, since they will stay upright with weight in the bottom. I made one using a cat carrier which has removable front and top doors. It is shown here with both doors removed, but you would normally remove only one door or the other depending on the position of the carrier and the cat. It is roomy inside, and he is mostly surrounded for a reasonably secure feeling. It is supported by cord at all four corners to keep it level as the cat moves around. A separate cord is attached to help position the carrier from the ground, steer it around branches and to pull it down if it gets stuck. To make the carrier, tie a piece of cord to both corners on the same side and then tie a knot in the center of the cord to make a loop for attachment to your rope. This knot in the center is important as it prevents the cord from sliding from one side to the other as the cat moves around. Do the same on the other side. Ideally, the cord should be secured to both the top and bottom halves of the carrier. If you tie it to the top half alone, then make extra sure that the bottom half is securely attached and won't be dislodged as it bumps into limbs. Adjust the lengths of the cords so that the carrier stays level when it is suspended and allows the cat enough room to step inside between the cords. Tie a separate cord to one end of the carrier to use to steer it from the ground as you pull it up and let it down. Cats probably find it easier and less frightening to step into a short container, compared to jumping to the bottom of a tall container. However, they probably feel less secure in a short container and may be more likely to get spooked on the ride down and jump out. Tall containers are probably safer for them, since the cat is less likely to jump out on the ride down. This picture shows one made by Bob Reese, a cat rescuer in Starkville, Mississippi. His brilliant solution uses a trash can inside a laundry bag. 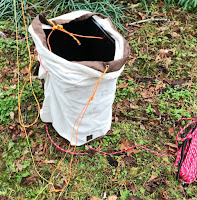 Once the cat jumps inside, he pulls a separate rope to pull the laundry bag over the top and tighten the drawstring to help keep the cat secured. Once the elevator box is built, you will need to set a rope in the tree to raise and lower it. The length of the rope needs to be more than twice the height of the cat’s pick up point, and it needs to be set on a branch at least two feet higher than the branch where the cat will be picked up. So how do you get the rope over that branch? If it is a light weight rope and the height of the target branch is not too high, you can simply tie a weight to the end of the rope and toss it by hand. Before you throw it, however, you first need to uncoil the rope and let it fall loosely in a random pile. You should do this on a blanket or tarp or in a box so that the little sticks and twigs on the ground do not snag it and cause it to tangle. The idea is to simply let the rope fall loosely in whatever position it naturally falls. Do not try to force it to make neat coils; just let it fall however it wants. When you reach the end of the rope, tie the weight on that end and throw it. The motion of the weight will feed the rope out of the pile usually without any tangles. You can throw the weight in one of two ways. The simplest is to throw the weight directly from your hand just like you would throw a baseball. You will be limited in how high you can throw it, but that may work in many cases. If you need to reach a bit higher, then you can dangle the weight from roughly two feet of rope by your side and swing it back and forth to refine your direction and then fling it. Of course, you need to be careful not to hit the cat. Another way to get the rope up even higher is to use a slingshot and a fishing reel. A simple two-ounce weight on the end of your fishing line can be shot over the branch, and then the fishing line can be used to pull the rope up over the branch. To lure the cat into the elevator, you need only place a bowl of food in the box before sending it up. You may also add a favorite toy, catnip, something with his scent on it or anything else that is attractive to your cat. Place it at the far back corner of the box so that he will have to step all the way into the box to reach it. Pull the box up to a point level with the cat and wait for him to step in it. If he puts only his front feet inside, give him a little more time. If he still doesn’t put his back feet in, then slowly pull the box up slightly higher to see if that encourages him. If not, then try lower. If he won't go into it at all, you may need to just tie the rope to a tree and leave him alone for a while to give him time to think about it. When I go to rescue a cat out of a tree, one of the first things I must do is use a very large sling-shot to shoot a weight with a string attached up into the tree above the cat. I use the string to pull my climbing rope into position. Some cats are so frightened by the sudden noise and commotion this makes above them that they quickly find a way down on their own. They try to climb down in a controlled way as best they can, but they usually end up jumping or falling along the way. If you think your cat may be frightened enough to do the same, then it may be worth a try to throw or launch something up into the tree above him. It is important that the commotion occur above the cat to scare him down. If it happens below him, he may climb higher in the tree. To do this, tie a weight to a string and throw it over a limb well above the cat. 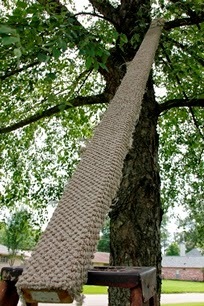 Use the string to pull it back and cause the weight make some noise as it moves through the leaves and limbs. Let it fall a little and pull it back some more. Watch the cat's reaction to it. Some are not bothered by it at all; some get nervous but don't do anything; some will come down.